I woke up, somehow. I felt significantly better than the day before. There was less poison in my body, that was for sure. I swore there was a giant bug on the wall. I was afraid to move, so I sat there just staring at it. Where was I again? 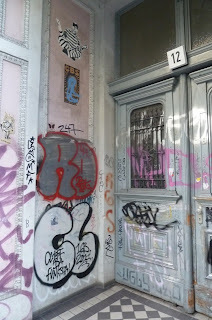 Oh yeah, at a friend's place in Kreuzberg. And when was it? It was sometime around mid-day, and the others were already stirring awake. We needed to get food. Nourishment. 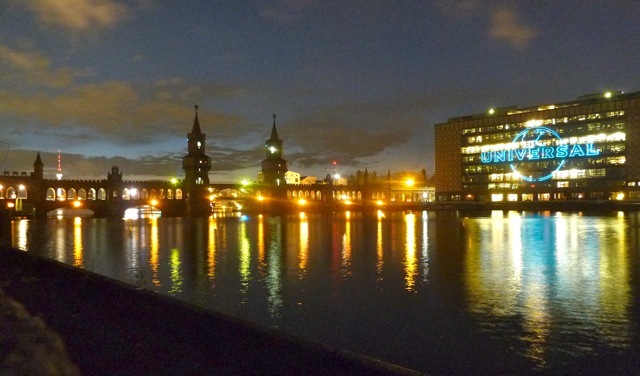 We were in the right city for it, and Mika said that he knew of a good place right on the Ufer of the canal. But when we got there, it just didn't seem right for us, more expensive and less of a selection than we wanted. There was a wildly decorated boat right on the canal, though. Very Berlin. We continued walking, wandering the streets of Kreuzberg. Somewhere along the way Antti and Mika were separated from the rest of us. We sat at a corner cafe and ordered some pizza and omelets. Quietly, we waited. I could hear my inner monologue going fast and sounding peculiarly like Anthony Bourdain. The last few days of debauchery were ones to remember, for sure, but somehow I couldn't remember much. No need to worry, it was Sunday in Berlin. And Sunday in Berlin means Flohmarkt am Mauerpark, aka the big flea market at the Mauerpark (Berlin Wall park). 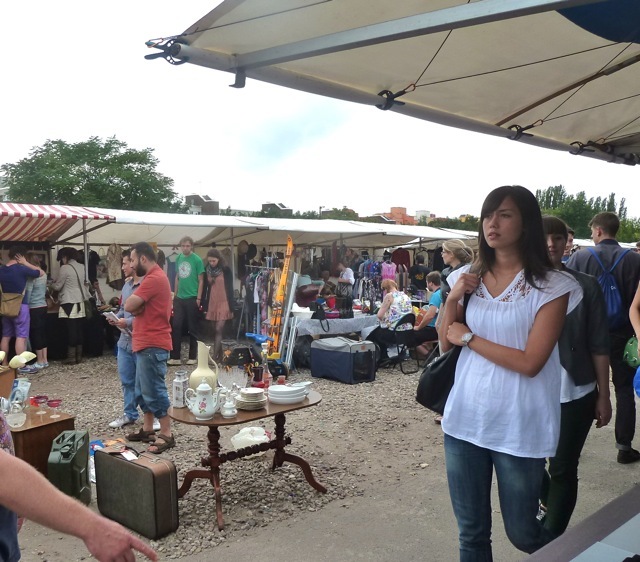 It's a big outdoor market filled with funky, alternative, vintage, cheap trinkets where you can get some good finds. It is precisely what you would expect in Berlin too: Great, quality, funky apparel and accessories just waiting for the taking. But that's not all. There's also karaoke! And not just any kind of karaoke, but a huge outdoor karaoke, where an audience of maybe 1000 people watch you sing. 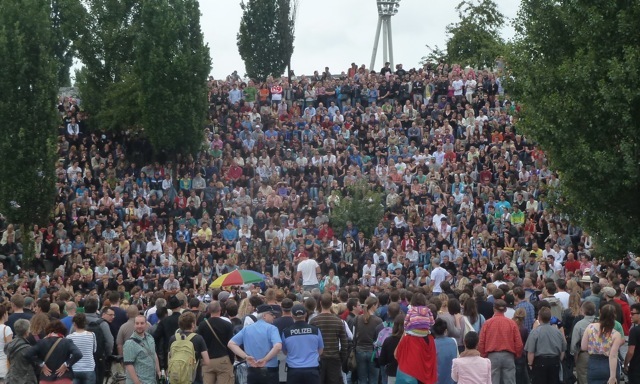 It's called bearpit karaoke, and it looks frighteningly intimidating for all but the least stage-frightened. Needless to say I was attracted to it. Alas, I didn't end up singing anything. I did sing along a bit, especially when the performer was singing "Livin' on a Prayer" by Bon Jovi - one of my personal favorites. 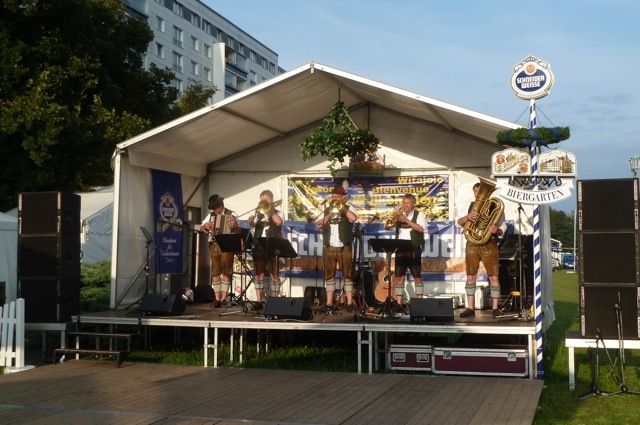 The beer festival of Berlin, which is the Berlin equivalent of Oktoberfest, was still continuing, so some of us headed there to grab some beer. (My friend, however, was keen on seeing a theatre performance so he went to the Tiergarten to buy his ticket.) And the beer at the beer festival was as beerful as ever, though it was noticeably quieter than in previous days. The girls had returned from their one-night Poland music-festival excursion, and one of them joined me at the beer festival just as the guys left for home. Walking around, we soaked in the sights of festively plump Germans, the sounds of cheesy Schlagermusik, and the smells of many types of bratwursts roasting on the grill. And, guess what? I ate horse meat! 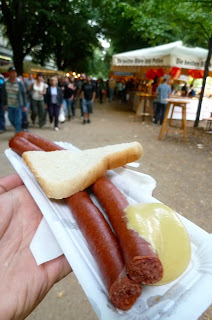 They were selling Pferde- bockwurst and salami, and I am not one to turn down a new type of food! We stayed there until another friend joined us, which was near the whimpering end of the festival, when they shut down the beer tents. What to do? 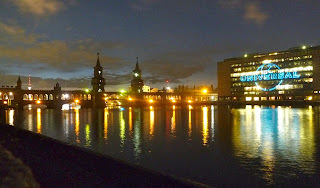 We just got on the S-Bahn and ended up at the Hauptbahnhof, where we bought some wine and beer, walked to the riverfront, and drank as night fell on the city. It was serene and pleasant, in a way that I really needed. Monday, things were a bit more quiet. A few of us, along with a new friend, at a Vietnamese restaurant in Schönhauser Allee. It poured rain, but only when I was arriving at the restaurant. Then it cleared up as we ate. My flatmate left right after lunch. Our new friend rode his bike as the rest of us took the U-Bahn to Kottbusser Tor. There, we set at a café on Oranienstraße, where my Finnish friend joined us. The girls soon said good-bye; one was off to catch her train back home. 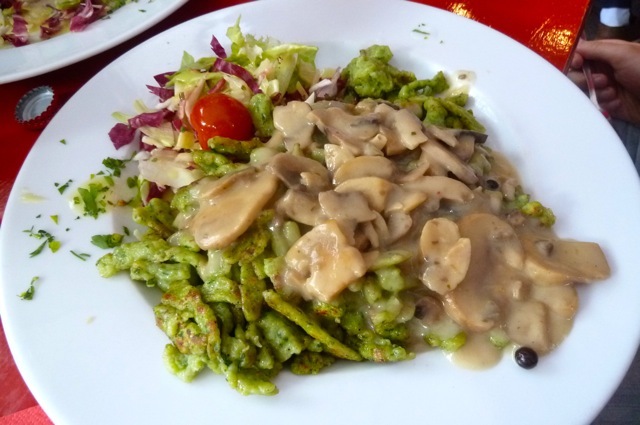 I then went back to my friends' place in Kruezberg, and we joined them for an early dinner at Spätzle Express. Rain began to fall again. We said bye, the Finns having to catch their flight (Mika had an earlier flight, but lost his passport). 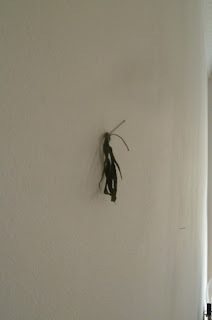 The girl who lives in the apartment returned (she was renting it out on Airbnb) just as I was leaving. 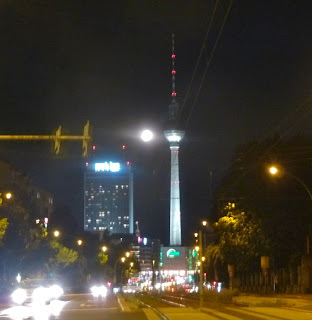 Later that evening, I met up with two friends again, this time at Schlesisches Tor, where we had dinner at a Mexican cafe. We shared nachos and then headed to a cool spot on the river, where you get a great view of the bridge and the "shitting camel" on the Universal building. We then went to Prenzlauer Berg and to a bar called Chagall, a Russian-themed bar by Senefelder Straße. Our friend from Neukölln was there, with a couple of his band mates, and a Canadian girl. I caught the last S-Bahn back home. A good day, and I could feel that things would soon settle down.